Garden-style Hotel with enclosed courtyard, fountains & water garden, opposite Stanford University & 20 miles from SFO Airport. Reach new heights of meeting success at the Sheraton Palo Alto. The hotel has newly renovated meeting rooms with new carpet, wall paper and window dressings. Our bright new colors will dazzle your attendees. 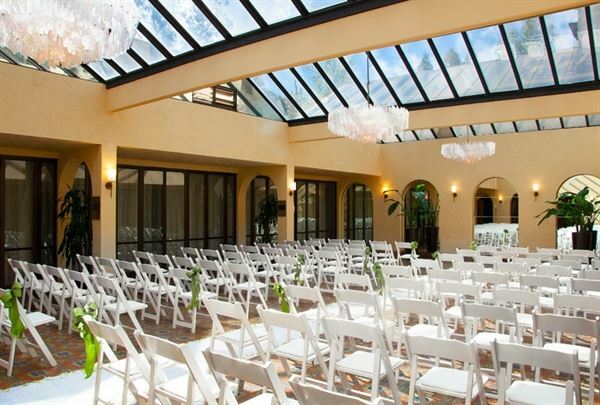 With over 12,000 square feet of flexible function space, the Sheraton Palo Alto Hotel is perfectly suited to accommodate your next meeting or event. Some banquet and meeting rooms offer sliding glass doors that open onto a spacious patio, allowing guests to enjoy both the indoors and outdoors. Plan your next board meeting in our executive boardrooms and enjoy lunch on our poolside terrace. A full-service banquet staff, along with our professional on-site audiovisual team, is available to service your every request. All banquet and meeting rooms feature wireless High Speed Internet Access, T1, and DSL lines.